Introducing one of the most unique legal tender gold coins in the world, the Perth Mint of Australia has made available the very first 2010 Mini Roo 0.5g Gold Coin that features a one-year-only miniature kangaroo design that will change annually. 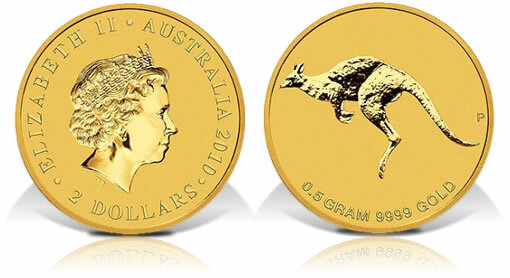 Containing 0.5 grams of 99.99% pure gold and at price point of AUS $45.51 (~US $38), the Mini Roo offers the public an affordable option to purchase a coin struck from 24-karat gold. The Perth Mint is no stranger to Kangaroo gold coins. It has been producing versions of them since 1990. The gold pieces are known the world over for the investment opportunities they provide and are offered in one kilo, one ounce, 1/2 ounce, 1/4 ounce and 1/10 ounce sizes. Designs on the smaller sizes change routinely, making them extremely collectible. As one of Australia’s most iconic animals, the Perth tends to use the kangaroo on other coin series as well. But what makes this new coin different than most is its smaller form and affordability. With a maximum diameter of only 11.6 mm and a thickness of 0.70 mm, the coin’s petiteness alone shouts as a collectible. Considered legal tender of Australia under the Australian Currency Act of 1965, the obverse of each Mini Roo shows a portrait of Queen Elizabeth II as designed by Ian Rank-Broadley. The coin sports a face value of AUS $2, but its intrinsic gold value alone is worth about tens times more. On the reverse, a kangaroo is shown in a bounding pose as one might see as the animal races across the outback. It was designed by Wade Robinson. The Perth Mint indicates plans to release the Mini Roo on an annual basis with differing reverses. The coin contains 0.016 troy ounces of gold and ships in a protective capsule to preserve the bullion finish found on each strike. The Perth Mint is the official issuer of the Australian Federal Government’s Gold and Silver Bullion Coin Program but is wholly-owned by the State Government of Western Australia. It opened in 1899 as the third Australian branch of Britain’s Royal Mint in response to rich gold deposits in nearby Coolgardie and Kalgoorlie. Half Gram Gold Coins are just little too small for coin collectors. I think I need special container to put this coin in. It is just too small to read letters on this 0.5 gram coins. This 0.5 gram coin costs 1 gold gram (spot). The best part is it states, “…The Perth Mint indicates plans to release the Mini Roo on an annual basis with differing reverses…” Assuming the roo faces right in 2011, which direction will the roo face in 2012? Hardly exciting. It’s apparently the first half-gram coin in history. That makes this initial issue collectible for me. Please email me if you know of an earlier half-gram coin from anywhere. Also unrelated question… I got no answer to on some numismatic forums, what was the first ever reverse-proof coin in the world? also did they make a proof version of this 2010 gold mini roo?